This is a little know fact that Jews escaping the Holocaust ended up in Shanghai. It’s common knowledge that as Hitler’s bid to rid the world of Jews escalated, so did the world’s refusal to let them in. What’s not well known is that when those borders, ports, doors, windows, and boundaries began shutting Jews out, in part by refusing to issue them visas, Shanghai, though already swollen with people and poverty, was the only place on Earth willing to accept them with or without papers. It was an exception that, for thousands, meant the difference between life and death. In fact, until 1941 when the routes immigrants used to get to Shanghai were closed off by the war and the Germans decreed that Jews could no longer emigrate from the Reich, Jews in occupied Europe were not only allowed to leave, but were pressured to do so through a system of intimidation and force. Although they didn’t make it easy, the Nazi party, eager to implement their plan to rid Europe of its Jewish population—to make it judenrein or “cleansed” of Jews—did allow Jews to leave under certain conditions. Though difficult to obtain, those documents, along with proof of passage to another country and/or a visa for permission to enter another country, were enough to get one out of Europe. Surprisingly, even for those already detained in concentration camps, the door, metaphorically speaking, was open, provided they could prove they would leave Germany once released. But of course, to walk through the door, one had to have some place to walk to, and that, for most Jews, was their biggest obstacle. Most countries made it either virtually impossible to enter (such as Switzerland, which insisted all German Jews have a red “J” stamped in their passports), imposed untenable conditions on refugees, or just simply wouldn’t issue visas. Shanghai—already home to a few thousand Jewish immigrants who started slowly arriving as early as the mid-19th century for business or later to escape the Russian Revolution—not only did not require visas for entry, but issued them with alacrity to those seeking asylum. In many cases, newly arrived immigrants were not even asked to show passports. It was not until 1939 that restrictions were placed on Jewish immigrants coming into Shanghai and even then these limitations were decided not by the Chinese, but by the amalgam of foreign powers that controlled the city at the time. This body, made up both of Westerners and Japanese who wanted to restrict the influx of Jews, decided that anyone with a “J” on their passport would now have to apply in advance for landing permission. And so, without the luxury of options, and desperate to evade the tightening grip of the Nazis, Jewish refugees by the thousands, as well as a small minority of non-Jews, set sail from Germany and parts of Central and Eastern Europe, settling primarily in the Hongkou neighborhood of Shanghai. Having been stripped of most of their assets upon their departure from Europe, the virtually penniless arrivals found Hongkou much more affordable than the city’s more developed districts. Although they came in a slow but steady stream from the beginning of Hitler’s rise, it was Kristallnacht in 1938 that catapulted the Jewish population in Shanghai from a few thousand to upwards of 20,000. Over the course of two days, Jewish businesses in Germany, annexed Austria, and what was then known as the Sudetenland (a region in what was then Czechoslovakia with a large German population) were looted, Jewish homes were destroyed, and Jewish men were arrested and taken to concentration camps. The migration that arose out of this traumatic event “ … lasted only until August 1939, when all the foreign powers in Shanghai decided to implement restrictions, which severely cut down the number who could enter,” writes Hochstadt. The Shanghai of the early 20th century was in many ways an energetic, challenging city that attracted the driven and ambitious. Shopping, theater, education, music, publishing, architecture, and even film production flourished, but as Harriet Sargeant, author of the book Shanghai explains, the assault on the city by the Japanese proved too much: “Between 1937 and 1941 the Japanese oversaw the destruction of Shanghai. One by one they stripped away the attributes which had made it great. When they finally seized Shanghai itself in 1941, they found the longed-for city no longer existed. The Shanghai of the ‘twenties and ‘thirties had gone forever. Nevertheless, many of the Shanghai locals, in spite of their own hardships, welcomed their new neighbors and shared what little they had, whether that meant housing, medical care, or just simple kindness. Gradually, with that support, Jewish refugees began, little by little, to create lives in their new country, and before long, the proliferation of Jewish-owned businesses was such that the Hongkou area became known as “Little Vienna.” Like their Chinese neighbors, they did their best to survive in difficult circumstances. They established newspapers, synagogues, retail businesses, restaurants, schools, cemeteries, guilds, social clubs, and even beauty pageants. They practiced medicine, started hospitals, got married, had babies, and held bar and bat mitzvahs. They learned to cook in coal-burning ovens and to haggle with street vendors. One Hongkou resident remembers the time and place with great fondness. The artist Peter Max, who would later become known for his signature “psychedelic” works of art, came to Shanghai with his parents after fleeing Berlin. Like many of the Jewish families who immigrated to the city, Max’s father started a business, in this case, a store that sold Western-style suits. It was, Max recalls, an auspicious choice, as Chinese men were just beginning to favor them over their traditional Mandarin clothing. The people of that community lived their lives as normally as possible until 1942, when the history they came so far to escape came dangerously close to repeating itself. Shortly after the Japanese bombed Pearl Harbor, Colonel Josef Meisinger, Chief Representative of Nazi Germany Gestapo to Japan, approached the Japanese authorities in Shanghai with “The Meisinger Plan,” a scheme to rid the city of its Jewish population by starvation, overwork, or medical experiments. Although the Japanese ultimately rejected that plan, starting in February 1943, they did require that every Jewish person who came to Shanghai after 1937 relocate to Hongkou, a relatively small area that already had an existing population in the hundreds of thousands. Although much of the city’s Jewish population was already living there, the crush of one population on another also dealt a brutal blow, with both disease and lack of food becoming even more critical concerns. Suddenly, curfews were imposed. Passes to exit and enter the ghetto were required. Food rations were implemented. It was not uncommon for 30 to 40 people to sleep in the same room (reports of up to 200 people in one room exist) and “bathroom” facilities in general consisted of little else than literal pots emptied by local laborers each morning. Still, refugees bolstered themselves by remembering that, in spite of these conditions, in Shanghai, they were the one thing they could not be in Europe: safe. Between the dismal state of the still-impoverished city and the beginning of the Chinese Communist Revolution in 1949, the city’s post-war Jewish population eventually dwindled to just a few hundred people, although there are said to be a few thousand Jews living there today. Eager to return to Europe or start new lives on other continents, most Jewish refugees left Shanghai at the end of WWII and with their departure began the dismantling of the culture and lives they established in China. Although the nearby apartment buildings that once housed both European Jews and Chinese alike are still in use, given Shanghai’s current construction boom, it’s not unthinkable that these monuments, too, could soon meet the wrecking ball. The White Horse Inn, a Hongkou café opened by Viennese refugees in 1939 that became not just a meeting place but something of a symbol of normalcy for the displaced Europeans, was demolished almost ten years ago for a road widening project. Other businesses of the era, once so crucial to the Jewish experience in Shanghai, are now represented only by rescued signage that hangs in the courtyard of the neighborhood’s Shanghai Jewish Refugees Museum. The museum, which includes the Ohel Moishe Synagogue, a center of Jewish life and worship for the Hongkou refugees, has become something of a touchstone of this extraordinary circumstance of history but between the exodus of the original Jewish population after the war and the city’s lack of interest in preserving this chapter of its past, one has to wonder if it will soon be the last monument to it standing. A restored Big Boy Steam engine would be a sight to see and a great piece of history preserved. SEVENTY YEARS AFTER THE FIRST Transcontinental Railroad was completed in 1869, the steep Rocky Mountains of Wyoming and Utah were still giving the Union Pacific Railroad trouble. Now, six decades after the last Big Boy was taken off the rails, the Union Pacific is rebuilding one of the famous locomotives in honor of the upcoming sesquicentennial celebration of the first Transcontinental Railroad. It’s a project so ambitious that Ed Dickens Jr, a Union Pacific steam locomotive engineer and the man leading the rebuild, has likened it to resurrecting a Tyrannosaurus rex. The Big Boy locomotives weighed more than one million pounds and were 132 feet, 9 inches long. Stood on its end, one would be the equivalent of a 13-story building. Each one cost approximately $265,000 to build, or about $4.4 million in today’s money. In the railroad world, the Big Boys were known as 4-8-8-4 articulated type locomotives. That designation meant the locomotive had four wheels in front, two sets of eight driving wheels (the large wheels connected to the pistons that make the locomotive move) in the middle, and four trailing wheels, all underneath one enormous boiler. Union Pacific purchased 25 of the Big Boys between 1941 and 1944. According toTrains Magazine, the steam engines were originally going to be named “Wasatch,” after the mountains they were built to carry freight over, but in 1941, an American Locomotive Company shop worker wrote “Big Boy” in chalk on the front of the locomotive and the name stuck. Below the steam engine’s new name, the unknown laborer also scratched a “V,” a popular symbol for victory during World War II, a conflict in which the Big Boy locomotives would soon play a pivotal role. Locomotive No. 4000, the first Big Boy, left the American Locomotive Company factory in Schenectady, New York, in the summer of 1941 bound for its new owner. The enormous steam engine garnered attention wherever it went and by one count, more than 500 newspaper stories were written about it before it arrived on the Union Pacific’s tracks in Omaha, Nebraska, on Sept. 4, 1941. Locomotive No. 4000 and the other Big Boys were quickly put into service just as the Allied war effort was heating up. Between 1941 and 1945, the steam engines helped move millions of tons of war supplies and other materials, according to the historian John E. Bush, a self-described “Union Pacific steam locomotive nut” and author of numerous train books and aTrains Magazine blog about the locomotives. “Without the Big Boys, the Union Pacific could never have moved all that material for the war effort,” Bush says. The Union Pacific used the Big Boys until 1959, when they were replaced with diesel-electric locomotives, which were easier and cheaper to maintain, although arguably less impressive than a noisy, smoke-belching steam engine with its symphony of moving parts. Most of the Big Boys were scrapped, but eight were put on display around the country. Although some steam engines still operate at museums and heritage railroads, for decades railroad enthusiasts believed the Big Boys were simply too big to ever run again. For one, the infrastructure needed to maintain such a massive locomotive had been torn down at the end of the steam era, and even if someone did rebuild one, there were few rail lines that could handle a machine of that size. But in 2013, Union Pacific announced that it was reacquiring a Big Boy in hopes of restoring it for the 150th anniversary of the completion of the Transcontinental Railroad. In spring 2014, Big Boy No. 4014 was moved from Pomona, California, where it was on display at the RailGiants Trains Museum, to Cheyenne, Wyoming, where Union Pacific keeps and maintains two other historic steam locomotives for special events and excursions. Since the locomotive’s arrival at Union Pacific’s shop in Wyoming, mechanics have been slowly rebuilding it, which requires the disassembly, inspection, and repair of every single part of the locomotive. The steam engine will also be altered so that it can burn oil which is easier to acquire than the coal it once burned back in the 1940s and 1950s. “This is a massive ground-up restoration,” Dickens says. Dickens hopes to have No. 4014 completed and operating on its own power before May 10, 2019, the 150th anniversary of the Transcontinental Railroad. The first trip is expected to take the locomotive to Ogden, Utah, not far from where the Golden Spike was driven at Promontory in 1869. * The ceremonial spike joined the rails of the Union Pacific from Omaha with the Central Pacific Railroad from Sacramento, connecting the the East Coast with the West Coast by rail for the first time in American history. Today, Promontory is a national historic site. Bush expects train enthusiasts and history buffs from around the world to line the tracks from Wyoming to Utah when the Big Boy makes its first run in 60 years. I am an old fart that can still remember soda Jerks and their unique lingo. THROUGHOUT THE 1940S, DURING THE post-dinner lull, students and staff at Columbia University would make a beeline for Friedgen’s Pharmacy up on Amsterdam Avenue. There, they’d tuck in to strawberry floats, marshmallow sundaes, and chocolate malts, all served up by Thomas Foppiano, “a small, squat, balding man who likes to laugh,” the New York Times reported. Many of these terms were used in only one soda fountain—or two at the most, with terms swapped around and mixed up almost as vigorously as the drinks they described. There was a certain amount of pressure to keep them up-to-date: An order of five small scoops of vanilla ice-cream topped with whipped cream, a maraschino cherry, and crushed fruit had the nickname “The Dionne Surprise,” for the famous Canadian quintuplets born in 1934. Often, the terms were a cocktail of performance and posturing. They were something for tourists to go out of their way for, and a distraction for Times Square showgirls out for a breather between rehearsals, as they sat on high red upholstered stools and nursed dishes of vanilla ice-cream. There was also something compelling about a kind of indecipherable secret language, where guessable terms (a “Traffic Light Sundae” was three scoops of vanilla, with a cherry of red, white, or green on each) mingled with cryptic ones (anyone for a “Brown Derby”?). On occasion, the code had a simple, practical purpose. That might be in protecting the privacy of the customer: The name of an order spiked with the laxative magnesium citrate would include Mary Garden “because it makes you sing.” If a customer left without paying, whether by accident or otherwise, it was often easier to shout “95!” than to explain what had happened. “99!” denoted the presence of the big boss or an inspector (soda fountains were notoriously unhygienic and tended not to use soap when washing dishes). The practice clung on for at least another couple of decades, but as the men got older, they moved on to higher paying jobs in bonds or sales, and gradually, the slang was mostly, if not entirely, forgotten. Meanwhile, national fast food chains replaced mom-and-pop diners and soda fountain drugstores. But little remnants of soda jerk lingo still persist in the English language—so spare a thought for their razzle-dazzle next time you’re offered a hot cup of java, or decide to indulge in an egg cream. All Black: Chocolate soda with chocolate ice cream. Baby: Glass of fresh milk. Black Bottom: Chocolate sundae with chocolate syrup. C. O. Cocktail: Castor oil prepared in soda. Canary Island Special: Vanilla soda with chocolate cream. Coffee And: Cup of coffee and cake. Eighty-Seven and a Half: Girl at table with legs conspicuously crossed or otherwise attractive. Give: Large glass of fresh milk. High Yellow Black and White: Chocolate soda with vanilla ice cream. In the Hay: Strawberry milkshake. Mug of Murk: Cup of coffee without cream. Ninety-Five: Customer walking out without paying. One On The House: Water. Pop Boy: Soda man who doesn’t know his business. Rhinelander: Chocolate soda with vanilla ice cream. Saltwater Man: Ice cream mixer. We get a look at missile accidents during The Cold War. In 1960, a test of a Titan I missile went smoothly until the very end. AFTER THE ACCIDENT, THE AREA around the missile silo was littered with debris—boulders of concrete, giant springs, pieces of navigation systems. The silo’s cover, made of hundreds of tons of concrete, was half destroyed. The remaining half, the author David K. Stumpf writes in Titan II: A History of the Cold War Missile Program, had launched into the air and spun 180 degrees before landing back on the ground. One moment, the team at the new operational test facility had been on the verge of celebrating, finally, a successful trial run of the launch sequence for the powerful Titan I missile. The next, they were bracing against an explosion that destroyed the facility beyond repair. At the end of the 1950s, the United States military began developing the Titans as part of its growing supply of intercontinental ballistic missiles. These were giant rockets, designed to fly long distances while carrying nuclear weapons. By 1960, teams at Cape Canaveral had run several successful tests of the new missiles, and a new facility, located at the Vandenberg Air Force Base in California, was ready to start testing out the missile under operational conditions. By the evening of December 3, 1960, eight tests had already failed because of “minor equipment malfunctions,” Stumpf writes. The team started running the procedure for readying the missile for liftoff. The aim was to bring the weapon right up to the point where it could be launched, without actually sending it off: They needed to know the missile would be ready to use in attack, if needed. Inside the super-hardened silo, meant to be protected from nuclear attacks, the team loaded the rocket with oxidizer, a key ingredient for blast-off, and sent it up to the surface. The countdown to launch started and then—right before the signal to ignite the rocket would have been given—it was stopped. The team had met its goal. All that was left to do was return the missile back to its silo and remove the dangerous oxidizer. But something—later determined to be an elevator malfunction—went wrong. Robert Rhodus, the test conductor for the company that had built the missile, “watched in fascination as the elevator, carrying a missile fully loaded with propellants, plummeted to the bottom of the silo,” Stumpf writes. The tanks that held the rocket’s fuel and oxidizers broke open, mixed, and exploded. The elevator structure and the launcher—tons and tons of steel that one witness later likened to “red spaghetti“—came flying from the silo as the test team ran for cover. Despite the size of the explosion, no one was hurt in the accident: The second-set of recently reinforced blast doors held. But the newly constructed test facility was so badly damaged it wasn’t worth salvaging. Today, there’s still a giant hole in the ground, now overgrown and given over to wild animals. The military continued to use Titan rockets as part of its intercontinental ballistic missile program through the 1980s, and this was not the only dramatic incident involving them. In 1965, dozens of people died after a fire started in a Titan II silo in Arkansas. Perhaps most famously, as the investigative journalist Eric Schlosser recounts in his book Command and Control, in 1980, a Titan II missile exploded in its silo in Damascus, Arkansas, while carrying a nuclear warhead. While the warhead inside the rocket remained in one piece, preventing a nuclear disaster, the crew working on the site did not escape without harm: One man died and more than 20 others were injured. There is absolutely nothing wrong with asking if you are a citizen. If you are an illegal you should be person non grata as far as any type of government program is concerned. If you want Medicaid,Food Stamps or any taxpayer funded program including reduced lunches and free health care you must be a citizen. We owe you as an illegal nothing. Over the 230 year history of the census, its questions about national origin tracked attitudes about race and nationalism. SINCE 1790, EVERY TEN YEARS, the federal government goes around trying to gather information about every person in the United States. The decennial census is mandated by the Constitution, and it’s happened 23 times in American history. Over these decades, the information the government has asked for has changed dramatically. The original census, in 1790, asked just four questions. The current administration is proposing a controversial change to the 2020 census: asking about citizenship status. Though the census has long been concerned with the national origin and naturalization status of people living in America, the current proposal would make the 2020 census the first time in American history that the government would ask the question “Is this person a citizen?” about every individual in America. Although the main purpose of the census is to count the population of the United States, its interest in naturalization has always been related to contemporary federal immigration policy, American attitudes about race, and the rise and fall of nativist sentiment in the country. The year of the first census, 1790, was also the first year that the U.S. restricted who could become a citizen, limiting naturalization to free white people who had lived in the country two years and could prove their “good moral character” to a court. Free black people, Native Americans, and indentured servants were all excluded. By this point, the federal government had already passed the first law authorizing deportation of any non-citizen who posed a danger to the country, but there was no restriction on immigration: Anyone could come. Non-citizens were included in calculations of political representation, too. It wasn’t until the 1850s that Americans started to be concerned about where, exactly, immigrants were coming from. In 1850, the census asked for the first time about a person’s place of birth; by 1870, the census also wanted to know where people’s parents were born. America’s borders were still open, but a growing wave of nationalism was pushing to change that. After states started passing immigration laws, the Supreme Court found in 1875 that regulating immigration was a federal responsibility. In the 1880s, Congress passed the Chinese Exclusion Act, along with laws restricting immigration for contract labor. By 1890, the share of the U.S. population that was born in another country was at an all-time high—14.8 percent of the population, according to the Pew Research Center—and the census started asking again about naturalization status. By then, a person had to have lived in the United States five years to become a citizen. The 1790 naturalization law had been expanded, after the Civil War, to allow black people to become citizens, but the Chinese Exclusion Act had explicitly prohibited Chinese immigrants from naturalizing. In 1884, the Supreme Court had also established that a person born to a Native American tribe was not an American citizen. By 1920, the census wanted to know not just where a person was born, but where their parents were born and what language they spoke. Between 1890 and 1920, about a quarter of foreign-born census takers reported that they were not naturalized citizens. That year the U.S. also enacted immigration quotas based on nationality that were in place, in some form, until the 1960s. In the second half of the 20th century, the government dropped the nationality quota system and changed laws that prohibited people from applying for citizenship based on their race. In these decades, the census de-emphasized questions about citizenship. Starting in 1970, the U.S. Census Bureau started drafting two forms of the census, the “short form” and the “long form.” The short form, received by most Americans, did not ask about citizenship. A much smaller sample of households would receive the more detailed “long form.” That form did include a question about where a person was born and if they had become a naturalized citizen. But only a fraction of the population had to answer it. Only in 1990 did the census start phrasing the question on the longer form as “Is this person a citizen of the United States?” In 2010, that question was removed from the census altogether, although it remained part of the American Community Survey, a more detailed but limited nationwide questionnaire. It’s this version of the question that could be added to the census in 2020. While the federal officials requesting the change argue that it will not affect the accuracy of the census, opponents fear that asking every person in America this question will dissuade people (undocumented people in particular) from responding at all. The census already suffers from underreporting among low-income and immigrant populations. If the main goal of this exercise is to count people in America, it’s possible that asking every person about their citizenship will skew the results. I remember seeing and using one of these machines when I was a kidlet. These retro machines, which make plastic souvenirs right before your eyes, are as popular as ever. IN 1971, SICK OF WORKING in middle management in Chicago, William Jones purchased a number of Mold-A-Rama vending machines on a whim. He knew nothing about the technology, which produces injection molded plastic figures, and didn’t understand its appeal, but saw the purchase as an opportunity to do something new for a living. Little did he realize that almost 50 years later, his family would still be in the business, maintaining a collection of the beloved machines, which are as popular as ever at zoos, museums, and other attractions across the United States. When Mold-A-Rama debuted at the 1962 Seattle World’s Fair, the molds of the Space Needle, a monorail, and other fair-related designs drew as much attention as the unique production process, which remains the same to this day. After inserting payment, customers watch two sides of an aluminum mold close as it is injected with heated polyethylene pellets. In less than a minute, the mold opens, releasing the plastic object. The signature “waxy” smell hangs in the air as the hollow figurine slowly cools. It’s not only nostalgia for the molds but this same, seemingly outdated process that keeps Jones in business. In an age when technology allows souvenirs to be more personalized than ever (see Japan’s purikura machines), the Mold-A-Rama’s simplicity is appealing both for those who grew up with the machines and new fans. Molds are all over the office of Jones’s Mold-A-Rama warehouse. Jones’s personal collection includes vintage plastic molds dating as far back as the 1960s. The Mold-A-Rama was the result of decades of work by J.H. “Tike” Miller of Quincy, Illinois, according to a history of the company in Mental Floss. Miller began experimenting with miniatures in the late 1930s. It wasn’t until World War II that he found a lucrative niche in plaster nativity models when imports from Germany—the largest supplier of these religious figures—were blocked. In 1955, he switched to producing figurines through plastic injection molding. An eccentric, he became known for molds of dinosaurs, aliens, and even a Purple People Eater. “[Miller] was one of the pioneers in the plastic era and stands out from all the rest with his unique way of molding plastic and the unique composition of the plastic material that he used,” says Ken Glennon, a Mold-A-Rama collector who is writing a book about Miller. During the mid-20th century, after Miller licensed the technology to Automatic Retailers of America, the memorabilia took off at national and international fairs with about 300 molds in use. What set Mold-A-Rama apart from other toys and souvenirs at the time was that it gave customers insight into the products’ manufacturing, as it was happening, decades before 3D-printing. A cast aluminum mold of the U.S. Capitol Building. Jones’s collection of over 200 molds includes original designs made for the 1962 Seattle World’s Fair. Now in his 50s, Jones travels the Midwest maintaining 62 machines at nine locations, including the Willis Tower, the Field Museum, and the Henry Ford Museum of American Innovation. Much of the machine’s appeal is the retro look; in 2006, William estimated that one in 10 people who pass a machine buy a toy. In addition to regular cleanings and occasional paint jobs, a major challenge is ensuring that the Mold-A-Rama produces a perfect mold almost every time. Although some people assume the Mold-A-Rama is as simple as a vending machine, dispensing pre-made molds, “it actually holds a gallon of hot liquid plastic all day long at 250 degrees [Fahrenheit],” Jones says. Small changes in temperature or the number of molds produced can affect quality. On a popular day, one machine makes 100 to 150 molds. A pile of molds at Paul Jones’s warehouse. Jones says that in recent years, many of his clients want unconventionally colored molds, such as the Lincoln Park Zoo’s green gorilla. Only minutes from the Brookfield Zoo, the Mold-A-Rama warehouse is packed with out-of-commission machines and parts. Rows of repurposed Cheese Ball jars are full of clear plastic pellets mixed with dyes that melt together to create the vibrantly colored molds. Jones estimates he goes through 640 55-pound bags of pellets a year. Jones also has an archive of more than 200 cast aluminum molds, including the 62 currently out in the field. He even owns some of the original molds, which were on display at the Seattle World’s Fair in 1962. His collection ranges from cute animals, such as a cartoon dolphin and piggy bank, to geographic-specific memorabilia, such as a San Francisco streetcar and the Houston Astrodome. During the holidays, he offers seasonal designs, including Santa Claus and a Christmas tree. He also has busts of all of the U.S. Presidents, up to John F. Kennedy. As Jones says, almost anything can be made in miniature. In Jones’s Mold-A-Rama warehouse, rows of repurposed Cheese Ball jars are full of clear plastic pellets mixed with dyes that melt together to create the vibrantly colored molds. Glennon says the internet has played an important role in Mold-A-Rama’s continued popularity, with rare molds selling for hundreds of dollars online. Molds that are difficult to produce, such as a replica of Colleen Moore’s Fairy Castle at the Museum of Science and Industry, are some of the most sought after. Despite its retro appeal, Mold-A-Rama is far from a dead art form. In fact, new designs are still being commissioned, at the rate of roughly two per year. For the past 25 years, Lois Mihok, an industrial model maker with 60 years of experience, has crafted numerous molds for Jones, including a bison, Oscar Mayer Weinermobile, and an Edison light bulb. Mold-maker Lois Mihok created the brown buffalo for the 50th anniversary of Mold-A-Rama machines at the Brookfield Zoo. Mihok says Mold-A-Ramas are more complicated than some of her other projects because she has to ensure the plastic will easily separate from the cast once formed. Removing the mold becomes more difficult if it includes an extremity—a tail or a leg, for example. But at the same time, designs with more detail and texture can counterintuitively be simpler to conceive because it’s easier to hide the mold line that connects the two sides. Although the 83-year-old says she’s never seen a Mold-A-Rama machine in person, she is excited that people across generations appreciate her work. The Mold-A-Rama heats plastic pellets to 250 degrees and includes a warning that the mold will come out warm and possibly dripping. Jones isn’t the only Mold-A-Rama operator who continues the family business in plastic toy vending machines. Tim Striggow runs the Florida-based Replication Devices, which operates Mold-A-Matic (Jones has the Mold-A-Rama copyright) machines in the South and Midwest. Like many of the “handshake deals” in their businesses, Jones and Striggow divided the country into territories, with Mold-A-Rama machines currently in Illinois, Wisconsin, Michigan, Minnesota, and Texas, and Mold-A-Matic machines in Florida, Tennessee, Oklahoma, and Ohio. While the companies operate independently, Jones and Striggow send new molds to each other and regularly talk through challenges in maintaining the decades-old machines. In the late 1960s, after visiting a state fair and realizing the machines’ business potential, Striggow’s grandfather Eldin Irwin first leased and later bought several from Automatic Retailers of America, which owned all of Mold-A-Rama until it divested in the early 1970s. Around that time, as a pre-teen, Striggow had begun helping monitor his grandfather’s collection. He remembers meeting Mold-A-Rama fans as he traveled to summer fairs with the machines. Some of those people came to the same events every year looking for the latest molds. Striggow never thought the business would continue, even when his mom and stepdad took over in the 1990s. Now some of his contracts are over 30 years old, and he employs his son-in-law. He says he has the largest collection of machines—around 120—with about half in operation, including one at Jack White’s Third Man Records storefront in Nashville. White saw a Mold-A-Rama when he visited Chicago in 2005 and wanted one for the Third Man Records Novelty Lounge. The Nashville machine produces a “cherry red” model of White’s 1964 Airline guitar. Third Man added a second machine at its Detroit location with a yellow replica of the label’s mobile Rolling Record Store. A backboard for a Mold-A-Rama machine. Jones says it is important to maintain the Mold-A-Rama’s retro look. Despite Mold-A-Matic being somewhat of a competitor, Jones keeps a model of the Jack White guitar in his office display case, which also houses original Miller molds and the stick his dad used to mix melting plastic. Although he’s not opposed to modernizing his business, adding credit card slots to machines and staying open to unconventionally colored molds like the Lincoln Park Zoo’s green gorilla, he credits Mold-A-Rama’s longevity to the old-school, vintage style. Until I read this story I never knew a cat was sent into space. And if all goes well, she’s finally going to get one. ON OCTOBER 18, 1963, A small rocket took off from a launchpad in Hammaguir, Algeria. It rose about 100 miles, cutting through the atmosphere, before it hit its upper limit and began plunging back to Earth. A small capsule separated from the rocket and floated down to land in the desert, and a team of French scientists helicoptered over and retrieved its inhabitant: a black and white cat named Félicette. Fifty-four years later, this fluffy pioneer will finally get her due. Thanks to a successful Kickstarter started by Matthew Serge Guy, preparations have begun for a permanent memorial to the world’s first astro-cat. Guy, a creative director at a London ad firm, was originally inspired in his pursuit by a chance encounter with a Félicette-themed tea towel, which he found in the kitchen of his shared office space. He had grabbed the cloth to dry a cup, and when he noticed what it said—“TO COMMEMORATE THE 50TH ANNIVERSARY OF THE FIRST CAT IN SPACE”—he stopped mid-drip. He’s not alone. While America’s space monkeys and Russia’s cosmonaut dogs have imprinted on the popular consciousness, Félicette and her journey are shrouded in obscurity, legend, and confusion. A short documentary preserved by France’s National Audiovisual Institute provides some information about the purpose of her journey. Scientists hoped to measure the impact of space travel on brain activity, and implanted an electrode in her head for this purpose. It also shows some highlights of feline space school, which involved cats gamely whirling about in a series of small boxes, and details how Félicette was chosen out of a whole lineup of trainees (she was the calmest). This conflicts with several newspaper accounts, which say she got the job because she weighed the right amount. Visually identifying Félicette is also difficult, as several clearly different cats are called by that name, both in the documentary and in news photos. One thing is certain, however. 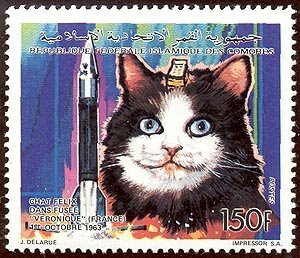 Félicette was not merely the first feline in space. She remains, to this day, the only cat who has ever left the atmosphere. (A second attempt a week later ended in disaster, halting this particular program for good.) When you consider the sacrifices she made to get there—the long weeks of training, the invasive skull surgery, and her euthanasia afterwards so that she could be studied further—her absence from the pantheon rankles. After all, Laika the space dog has a monument in Moscow, Sam the rhesus monkey got a temporary memorial in Riga, and Ham the Astrochimp has a plaque in his honor at the New Mexico Museum of Space History, complete with a plastic banana. This indignation eventually proved contagious. On November 16, just a day before the countdown clock was set to expire, the Kickstarter reached its goal. Guy now has £43,323 (about $57,000) to get Félicette off the ground once again. Plenty of people have agreed to help out, including sculptor Gill Parker, whose specialty is animals cast evocatively in bronze. His first priority, he says, is to find a willing site, preferably in Paris. He wants Félicette to avoid the fate of, say, Detroit’s proposed Robocop statue (which, despite the will of the people, has taken many years to materialize). “The last thing I want is her commemoration to be shoved in a garage somewhere,” Guy says. Any cat would hate that, especially, we might imagine, one that once reached a perch higher than any other. This jail was once owned by the impish wise cracking Charlie McCarthy. Harvard Jailhouse Tom MClaughlin/used with permission. In 1943, the city of Harvard, Nebraska, accidentally sold its jail. To a 16-year-old boy. For $1.50. Robert Pinckney, teenage son of the local physician, was looking for lots to lease for victory gardens when he noticed the town had accidentally included the jail in the list of properties for sale. When he told the city council about its mistake, they laughed at him. So he bought it. Even after he was given the deed, the town of Harvard refused to admit its mistake and kept housing criminals in the small building’s two cells. Pinckney hired a lawyer in an attempt to sue the city for owed rent. Harvard agreed to pay but added some rather superfluous requests, including removing the sidewalk from the property. Pettiness aside, the city attempted to keep the embarrassing matter under wraps, but once Timemagazine and other news outlets got wind of Pinckney’s story, Harvard’s mistake was national news. Pinckney offered to sell the jail back, but he was too young: the law said he couldn’t deed the property to anyone until he was 21 years old. A recovering sailor in Los Angeles suggested the teen put the jail up for sale at a West Coast war bonds auction. Charlie McCarthy, ventriloquist Edgar Bergen’s famous dummy, bought the place for $10,000 in war bonds. In the end, after the publicity died down, the dummy quietly gifted the jailhouse back to the city. It still stands in the same place today, a testament to bureaucratic error and teenage enterprise. Just follow the main road into this small town. You can’t miss it. I can still recall my Aunt Maxine’s phone number they lived in the country in Warren, Indiana it was 535R-3 that meant with three rings the call was theirs. AMERICAN PATENT CLERKS IN THE 1870s could scarcely have imagined how two inventions, filed two years apart, would together change the lonely lives of frontier Americans. In 1874, there was barbed wire, and in 1876, Alexander Graham Bell’s revolutionary telephone. Together, in an amazing display of rural ingenuity, they connected isolated homesteads to their rural neighbors and the rest of the world. By the 1880s, thousands of miles of barbed wire snaked their way up and down the country. To turn the steel fence wires into telephone lines, they simply had to be connected to a telephone in a house or barn with a piece of smooth wire. The signal then passed through the smooth wire, and along the length of the barbed wire, either to a switchboard or to other houses down the line. In some cases, as many as 20 telephones were wired together—all of which would ring simultaneously with each call, regardless of who was making it and who they were trying to reach. Agreed-upon codes—three short rings for you, two long rings for me—helped people know if the call was for them. This connectivity fundamentally changed the nature of life on the frontier. In Big Bend Country, Texas, the advantage of the network was not the way it connected farmers to the outside world, but how it linked so-called neighbors who lived miles apart. “Wherever these country telephones have been introduced, and they may appear extremely primitive, they are regarded as an indispensable convenience,” writes Richard F. Steele in An Illustrated History of the Big Bend Country. In the event of a medical emergency, a doctor could be summoned in minutes, without the agonizing wait for a messenger boy on horseback to make it into town and back again. When, elsewhere in the state, two expensive purebred bulls were killed by new trains that ran to Arizona, the railroad company compensated local homesteaders in Hidalgo County by allowing them to use the barbed wire in the railroad right-of-way fence as a telephone line. Emma Marble, a young woman homesteading in the area in 1899, remembered how the line kept loneliness at bay and brought neighbors closer together. “The theory was that we would answer only when our own ring sounded, but whenever the bell rang, every woman on the line rushed to a receiver,” she recalled. Homesteaders often suffered from what today might be thought of as crippling clinical depression, brought on by days, if not weeks, of solitude, isolation, and physical labor. Marble herself lived alone on a property of 160 acres. “News and gossip were common property, like the sunlight, and we never had any privacies when we went to the telephone.” This bonhomie must have seemed as warming as the sun’s rays, particularly for women, whose role as “angels of the home” often left them stuck in cabins or sod houses. That said, the number of people on the line at any given moment could be irritating. Every now and then, someone cut into a conversation, while multiple listeners reduced what any one of them would be able to hear.“Get off the line!” was a familiar refrain. Writing in Telephony magazine in 1886, J.L.W. Zietlow described the resulting chaos when cattle broke down the fence wire, cutting off people who had come to rely on their telephone. “It goes without saying that I have been prejudiced against fence wire telephone lines ever since,” Zietlow wrote. “I know of many bad mishaps; and in one particular case, the loss of a human life is attributed to a barbed wire telephone line failing to work.” It seems far more likely that barbed wire telephone lines saved lives, especially in cases of high-risk pregnancies or falls from horses. Until the phone companies eventually wired the rest of rural America decades later, these inconveniences were minor—someone had to go out and ride the fence anyway—for a connection to the outside world, one that shrank the open frontier to a much, much more manageable size. From a distance, at least, there seems to be no rhyme or reason to the way Americans got their telephone numbers. And it’s becoming even less clear thanks to the increasing sophistication of the phone technologies we use. To understand the reasoning for the current telephone area codes, it’s worth keeping in mind two things: the way that population levels differ from state to state, and the basic design of the early system. The North American Numbering Plan, which the Bell System put into place starting in the 1940s, was designed to replace a far-more-complicated system that relied on operators to manually move calls through the system. The phone company wanted to make it possible for anyone to call anyone, anywhere, in an automated way. Initially, this was sold as a boon for operators. “In a few years long distance operators will be dialing calls, directly and unassisted, straight through to telephones as far away as the other side of the continent,” exclaimed a 1945 statement from Northwestern Bell published in the Minneapolis Morning Tribune. The truth, of course, was that the goal was to remove operators from the equation entirely—because there would never be enough human operators to fill the inevitable need. Requiring human interaction just to dial a number from a certain distance created artificial limits on how big the system could become. To help with this, Bell put together an array of 86 separate areas, called Numbering Plan Areas, across North America. According to telephone researcher Linc Madison, 34 states and D.C. had just one area code each at the time, while New York State had five and a single area code covered three Canadian provinces. At the time, Alaska and Hawaii were not states and did not initially get a long distance code. But the question, of course, is how to organize that system. And that’s the part, from the outside, that doesn’t seem so clear—especially compared to other large, national apparatuses. The U.S. Interstate system, which has odd numbers going north and south, even numbers going east and west, and highway numbers that grow higher in value as you go further east or north, has a clear logic to it, even if it sometimes veers from this logic. Likewise, the first three digits in the U.S. ZIP Code system get higher the further west you go. In comparison, area codes within the North American Numbering Plan don’t break down quite so neatly. That’s because the real factor here wasn’t geography, but population need. As shown by this map, Bell appears to have based its initial decision-making on area codes with an eye toward future need. The real tell, in this sense, wasn’t the first number in the three-digit area code; it was the second. Initially, every area code installed had a second digit that was either a 0 or a 1. States with more than one area code generally had a 1 as a second digit (hence why New York City’s most common area code is 212), and states with a single area code generally had a 0 in the second digit (hence why Florida has the 305 area code). This structure meant a couple of things: First, it was a bit of a godsend for people dialing on rotary phones, because it made the most valuable area codes the easiest to dial, making analog dials easier to push around when making a call. But more importantly, it meant that the system was built with a degree of future-proofing. By leaving out numbers higher than 1 on the second digit, that meant that numerous area codes would be available in the decades to come, in case growth spurts hit and suddenly your state needs a lot of area codes. Beyond that, there wasn’t really a specific order to how the area codes have been doled out, although there seems to have been a genuine effort made to avoid putting similar area codes next to one another. One of the few examples of abutting codes on the 1947 map is Virginia (703) and North Carolina (704). As highlighted by this 1960s-era map of numbering codes, the two codes were quickly separated. This system wasn’t perfect, but its design suggested the work of engineers who knew the rule book would eventually be thrown out. Of course, the hard part about all these changes was selling them to the public, and on that front there was some resistance—including some from a future political leader. The group, formed in 1962 with the help of a want ad, fought the idea of moving away from this letter-based system in part because it felt longer numbers would be harder to remember. The group fought the effort in court, but despite winning an early round, ultimately lost the battle, as proven by the fact that numeric phone numbers and area codes are everywhere. The system is full of quirks, of course. This goes both ways—some of the most remote parts of the U.S. have a traditional area code despite being nowhere near the U.S. mainland. American Samoa (area code 684) is more than 4,800 miles away from California, and both Guam (area code 671) and the Northern Mariana Islands (area code 670), are nearly 6,000 miles away. The decisions made with area codes early in the history of the telephone system have deeply impacted everything that’s come since. It seems apparent, in hindsight, how inefficient the process actually was. At first, the breakdown of area codes stayed relatively stable, but as we started using telephone lines for more things—modems, fax machines, pagers, and later, mobile phones—the crunch became more apparent. By 1997, Maryland had to switch to 10-digit numbersfor local calls to make room for all the extra demand. Cities like New York found themselves having to rely on multiple area codes over a small area. The result of all these changes is that looking at the map of area codes, particularly this version designed by Linc Madison, feels exhausting. Area codes that once covered entire states now represent tiny portions of that state. It’s kind of like watching cell division happen in real time. All of this has had a strange effect on identity. In a 2014 piece on area codes, The Atlantic’s Megan Garber made the case that smartphones have turned area codes into regional identifiers, especially for people who move. This probably explains why there’s a company that actually sells 212 numbers to people who really want a New Yorker identity—as well as why there’s resistance when new area codes get introduced, overlaid on top of old ones. In 2015, the addition of the 628 area code in San Francisco, famed for its 415 code, led to a lot of heartache from locals. As time goes on, however, it’s going to become harder to keep this old integrity in check. NANPA has already given itself an out: When we inevitably run out of the current numbers we have, the administrators will push us toward adding yet another number to the current lineup of 10, plus one more for the country code. It already has a number set aside for this reason. These days, area codes get added to the system all the time—and codes that once represented entire states now make up a single city’s metropolitan area. As populations have grown and people increasingly use telephone numbers for a variety of purposes, the logic of the area code system seems harder to grasp than ever. That logic, while a little cloudy in the 1940s, made at least some sense once you broke it down. In 2017, good luck trying to apply it to the myriad number of codes you’ll find around the country. So, what’s the best explanation as to why one area code gets used over another in a given area? To put it simply, it was the code that was available. *Correction: This post previously stated that the Anti-Digit Dialing League formed in response to the development of area codes. It formed in response to the replacement of word-based telephone exchanges with all-number dialing.